Home Fishing Tips Which Is The Best Fish Finder For The Money? Note: If you’re looking for information on the best fish finders in general, check out this page. Take it from the fish finder experts: there are WAY too many choices out there when it comes to fish finders. Don’t we all wish it was just so much easier to make the right choice? A choice that would continuously net us fish after fish after fish, and give us the least amount of hiccups possible? It’s not too hard to choose the best fish finder for the money. In fact, here’s a dirty little secet: make the “money” part your deciding factor, and go from there! Let me explain: If you are having to ask this question, you are probably a recreational angler that wants to catch more fish, right? As easy as that! So first, you need to decide how much you are prepared to spend. You can find a fish finder for less than $100, and you can even find one for $2000! To make things simpler, we’ve divided up all of our fish finders by budget range, and given you an overview of what you should expect to get out of however much you decide to spend. For this price range, you are looking at a very basic fish finder that has a small, low-resolution black and white screen and no GPS. This means that the readings you will get will be rather cramped and possible even a little tough to interpret, since color screens generally show better results. These guys will have a low power rating and a lower end transducer, which means the most depth you will get is about 100-150 feet. The readings will be good, but not fantastic. I’d recommend a fish finder in this range if you are just starting out as an angler and generally fish really shallow water from a small boat. The Lowrance Hook 3X contains a backlit LED, 3″, color display, plus a high-performance Broadband sonar with noise rejection, Advanced Signal Processing (ASP), and precise target separation which makes seeing fish easier. It also comes with an onboard temperature sensor, and it can support between 83 and 200 Hz frequencies, which lets you choose the best frequency for your current water conditions. It has a precise, 320 x 240 resolution so that you can clearly see in the sun, and from wider angles. The Lowrance Hook 3X comes with a Broadband Sounder™ that easily finds fishing targets, bottom hardness and contour, thermoclines, and a lot more. Advanced Signal Processing (ASP) lessens the necessity to adjust settings manually, so you can see what is below you more clearly. 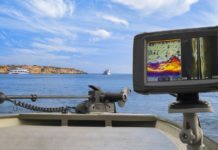 The STRIKER dv series includes CHIRP DownVü scanning sonar, which gives you distinct images of anything below your boat. The STRIKER sv includes both CHIRP DownVü and CHIRP SideVü scanning sonars, so that you can find things on either side of your boat. You can even use a split screen to show both the waypoint map and your sonar option, or even design a customized sonar view at the same time. The STRIKERS series come in 3.5, 5 and 7 inch size displays. 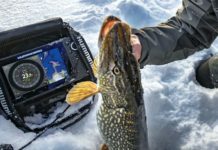 It also has a built-in flasher with lets you see your sonar data in a classic flasher format, which is perfect for ice finishing, and for vertical jigging. The Garmin EchoMap 43DV comes with a brand new echoMAP CHIRP dv and sv series chartplotter/sonar combinations. You can purchase these series in display sizes between four and nine inches. The dv series gives you onboard regular CHIRP sonar, plus a CHIRP DownVü. The sv series also offers onboard CHIRP sonar, plus CHIRP DownVü, and CHIRP SideVü scanning sonar abilities. It also has an internal 5 Hz GPS that renews the heading and the position each second five times. Each of the display sizes for the echoMAP combos can come with either U.S. BlueChart g2 charts, Canada LakeVu HD maps, U.S. LakeVü HD maps, or a basemap that is worldwide. The CHIRP Sonar provides a continuous sweep of frequencies that range from high to low, and it interprets the each of the frequencies individually when they return. It also includes new software like the new Garmin Quickdraw Contours that allows users to make their own maps that include up to 1-foot contour lines, anywhere you want. Also, for between $100 to $300, there are a couple of really cool smartphone fish finders. These are devices that can mount to your boat or attach to your line, which you cast and the device will send the SONAR returns to your smartphone screen via an app(iOS and Android). They have great battery life, and capitalize on your smartphone’s capabilities – so while they’ll work even if you don’t have a data connection, if you do, you’ll see loads of real-time info, too. Check them out – our favorites are the Deeper and Vexilar SP200. The Deeper Smart Fishfinder 3.0 is an echo sounder that is wireless and castable. You can use it easily in any spot as it just floats on top of the surface, and then sends all the information from the bottom and the water column to your smartphone or tablet. It will tell you the depth, temperature, vegetation, bottom structure, fish location, and any other data points you need to know. 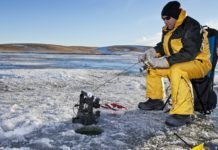 It works up to 130 feet with a secure Bluetooth connection, so it is ideal for short distance casting like ice or canal fishing. The Deeper app is easy to download and use. When used with the device, it creates a complete piece of underwater sonar technology. It is compatible with most iOS and Android devices. You also do not need a Wi-Fi internet connection, or need to use any mobile data since the Deeper device only uses its internal Bluetooth access point that easily links to your phone or tablet. The Vexilar SP-200 is mounted permanently onto a boat, and can be run with a 12 volt power supply. It can turn your smart phone or table into a completely functioning sonar system, which can compete with all high end sonars that are on today’s market. It uses a patented WiFi signal technology that lets it communicate directly to your smart phone or tablet. It works anywhere in the world, and does not require cell phone coverage to work. It makes its own WiFi hotspot, which is shareable with as many people as you would like. You can download the app for free from the App store, and it can work with both Android and iOS systems. The Vexilar is available in 17 languages with three different configurations. It also comes with a neoprene arm band, so your phone will remain safe with easy access while in use. This price range is the “premium” that combines all the best technology into small packages. If you have the budget, I highly recommend that you find a model from this price range. Generally, these models will all have color screens, usually 5 inches, a high power rating(for more depth), internal GPS with decent maps(and the ability to expand), and some models will also have Down Imaging/DownScan SONAR. With all of these models, you are looking at depths of at least 500 feet. 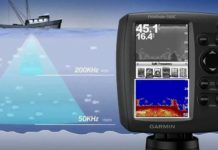 Fishfinder technology that can easily find anything under your boat. It has a high degree of accuracy with a built-in GPS antenna, and a precise U.S. Map that shows over 3,000 lakes, river and coastal contours up to 1,000 feet. It comes with upgrade option on its America’s Chart, Navionics hotmaps, Jeppesen C-MAP max n, and global Charts. 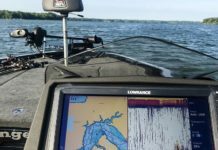 The Lowrance includes customizable maps that can be designed from sonar logs, and it uses technology that can overlay settings so you can see fish and bottom detail clearly. You can even look back on recorded sonar history to see what was previously under your boat at the same spot. The Raymarine Dragonfly 5 Pro offers consumers a 5″ all-weather GPS navigation device. It has an anti-fog feature with a blacklit, high-definition LED display, which is optically fused for crisp colors, and for viewing wide angles. It has a dual-channel with a wide-spectrum CHIRP sonar, plus DownVision® technology that gives users photo quality images of everything under their boats. It also comes with a MicroSD™ card slot that gives you additional storage for maps. The Raymarine Dragonfly also has built-in WiFi that lets you stream information straight to your phones through Raymarine’s WiFish mobile app. The Raymarine Dragonfly-5 Pro Fishfinder/GPS Chartplotter Navigation Combo also functions effortlessly with the optional Navionics and Raymarine Lighthouse format charts. It also includes a ball-and-socket swivel mount for easy display while in use. The Garmin EchoMap 55DV is an easy to install and easy to use device. It includes CHIRP Fishfinder and Chartplotter with Canada LakeVü HD Maps that lets you zoom in on the fish in your area. It has a 5″ color display with keypad control. The high performance device has preinstalled LakeVü HD maps with over 13,500 Canadian lakes. It is created to give you a precise picture of what is under your boat by using the built-in multi-frequency CHIRP sonar, 77/200 kHz HD-ID™ sonar, and Garmin CHIRP DownVü™, which is the best scanning sonar on the market. It has an extremely accurate system of features that include an internal 5 Hz GPS position with heading updates five times a second. The Garmin EchoMap makes it a lot easier to mark your position so that you return to your waypoints fast the next time. A single microSD™ card slot allows you to use the 55DV’s expandable memory to access accessory maps like LakeVü HD Ultra and BlueChart® g2 Vision® map cards. Quickdraw Contours custom map is also included, along with an Auto Guidance 3.0 capability, and NMEA 2000 for sensors, engine data, autopilots and more. The device cord can plug right into the mount so that you can quickly install and remove the device, and it also comes with transom and trolling motor mounts. At this price range, you will be paying for all of the features of the group before this one, and two more critical ones: screen size and expandability. From here on, you are looking at really professional level models like the Lowrance HDS series and the Humminbird 700/800/900/1000 series, all of which have very powerful SONAR, high-definition screens, powerful mapping packages, and the ability to add more peripherals like radars, weather, satellite radio, and the ability to network 2 or more units together. Something in this range is good for you if you are a professional(or aspiring professional) that wants something that can help monitor everything on your boat from SONAR to navigation to even monitoring fuel levels in your motor/engine. Tournament anglers and professional charters all use units that are in this range. At $600-700, you will get a basic model, and as you go more expensive, you are looking at larger and larger screens with more advanced peripherals. The Lowrance Elite-7Ti Mid/High/TotalScan Fishfinder/Chartplotter gives users a vast assortment of features and functions at a great price. It is compatible with both Bluetooth and wireless, and it has an intuitive touchscreen interface. It has a high performance sonar, that includes CHIRP, StructureScan®, DownScan Imaging™, and SideScan Imaging™ for clear pictures, plus it has the recognized Lowrance navigation technology. The Lowrance Elite has a 7” touchscreen display with high-resolution, and StructureScan® HD compatibility. It includes a built-in GPS with the reliable Lowrance navigation technology that makes navigating easy. TrackBack™ allows users to go back through your sonar, SideScan, or DownScan history, so that you can mark them for future reference. There are optional Americas chart upgrades that include Lake Insight™ and Nautic Insight™ PRO and HD, Navionics HotMaps® Premium and Fishing Hotspots® PRO. Optional Global chart upgrade includes Navionics+ and Jeppesen C-MAP MAX-N. If you have an Internet connection, you’ can access GoFree Cloud, where you can purchase Insight maps, and third-party maps from GoFree partners. The Humminbird® Helix™ 10 DI GPS Fishfinder/Chartplotter is one of the more sophisticated mixes of wayfinding technology and fish-detecting on the market today. It gives you remarkable Down Imaging at 455/800 kHz with picturesque images of everything going on underwater. It also has Advanced SwitchFire™ sonar that allows you to determine your onscreen detail levels, plus account for temperature, water depth, and turbulence. You can even try out different lure presentation by just pushing one button. The DualBeam Plus sonar uses a mix of arrangements for highly accurate returns and search areas, which cover a wide area, all on the same display. The backlit LED display shows returns in vivid detail with an extra-bright 10” screen. It has built-in GPS with the included ContourXD mapping, which makes finding your best course for the day easy and fun. It covers over 3,000 US lakes, and includes varying depth contours. The Humminbird Helix 10 DI GPS Fishfinder/Chartplotter is compatible with many of today’s popular mapping suites, which include Humminbird LakeMaster®/PLUS, Navionics® Gold, HotMaps and Platinum+, Humminbird AutoChart® and AutoChart PRO™, and Minn Kota® i-Pilot Link. The Humminbird Helix 5 SI CHIRP fish finder has to be one of the most powerful fish finder gps combos that you can buy for just under $500. It has super accurate CHIRP SONAR, as well as side imaging SONAR, and includes a fully featured chartplotter that is compatible with a whole host of different mapping packages such as Navionics and Humminbird LakeMaster, to name a few. In addition, this fish finder will let you see up to 1500 feet(on a good day in fresh water) using the traditional SONAR, and up to 240 feet on either side of your boat with Side Scan SONAR. The real advantage of Side Scan SONAR is that you can map out an entire area of water with a single pass and immediately identify good areas of structure and cover, as well as find schools of baitfish! The GPS functionality of this fish finder is also very good: you can store up to 2,500 waypoints, 45 routes, 50 tracks, and 20,000 track points – which is more than enough, really – who is going to need 2,500 waypoints anyway! You can also use the Side Scan SONAR to overlay contours and depth data on to the map itself, effectively creating your own customized maps. There are actually quite a few great choices for a fish finder GPS combo under $1000 – once we’ve got so much flexibility in our budget, it becomes a little harder to narrow down choices. However, we’ve picked three that really caught our eye(and helped us catch fish!) – and each one has their own one important feature which may help you decide which way to go. The Simrad GO7 XSE is well below our budget cap of $1000, but still sports a high resolution 7 inch display, an excellent mapping package(waypoints and tracks are all default options on gps fish finders, anyhow), as well as CHIRP SONAR, Down Scan, and Side Scanning SONAR. The GO7 is also fully expandable using NMEA 2000, so you can hook up your audio system, your motor for fuel and monitoring, and effectively turn this unit into the control system for your boat. If you have a more complex boat setup that you’d like to manage from a single interface, then you really can’t go wrong with this fish finder. The Humminbird Helix 9 DI is much like the Humminbird Helix 7 we saw above, except on steroids! It can do everything the Helix 7 can do(though this model only supports Down Imaging with the default transducer) – plus a whole lot more. The larger screen models are meant to become control centers for your boat, so you can hook up other components on your boat using NMEA 2000 and manage them all from one screen. You can even hook up your phone with Bluetooth and see missed calls and text messages! Though honestly, when you’re out fishing, you don’t want to be bothered with phone calls! The mapping packages and charting options are solid, plus expandable using the memory card slot, so you can use any mapping package of your choice. Navionics+ has highly detailed charts, and is the chart of preference for many anglers – which you can use with the Helix 9 DI. 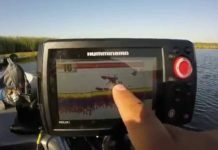 Finally, because Humminbird and Minn Kota have the same parent company, many Humminbird models integrate with Minn Kota motors – so if you have a Minn Kota motor that has their iPilot GPS, you can hook it up to the Humminbird Helix 9 and effective set courses on the screen and have your motor get you there! Screen size is incredibly important! Even though the difference may seem like one or two inches, since it’s measured diagonally, the overall size is drastically different. To get an idea of how big fish finder screens are, check out our fish finder screen size comparison.